Bands who name themselves after mythological gods can sometimes come off as pompous and a little bit insincere. Several metal bands named for gods are out there today, and I only truly enjoy one of them. 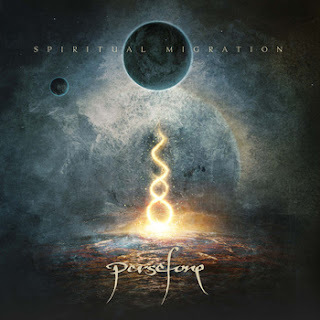 Persefone is an Andorran progressive metal band that dares to dabble in many different styles. Their approach to modern extreme metal is admirable. If You don't know much about Andorra, who can blame you. It is a small country located in the Pyrenees Mountains sandwiched between Spain and France. The entire population of the country is 85,000. For comparison's sake, Meridian, Idaho, the city in which we live, has 81,380 people. Thus, it is interesting that any metal band comes from that nation. As for style of music, the concept is almost purely metal. The band's previous album, "Shin-Ken" had an oriental feel to it, where approximately half the album was raging extreme metal, while the other half was quiet, reflective ambient instrumental music. This offered a bit of confusion, but after listening to the album several times over, I began to get a feel for the intended flow of the record and thus, appreciated it more. A few weeks ago I was listening to a song from "Shin-Ken" and found myself wondering if they had any new music coming out soon. As it happened, the release of a brand new opus was taking shape. "Spiritual Migration" takes off right where "Shin-Ken" left off, but added several refreshing new elements to the music. The Orchestral backing on several of the tracks was a welcome addition. This is added to the fury of metallic riffing with ultra-quick, razor-sharp drumming, which creates an almost surreal effect, like glimmers of light pierced a darkened void. The string sections then subsided for a few tracks, giving way to serpentine guitar leads and voracious grunted and howled vocals. This sound is what Persefone has become known for. Later on the album, the orchestration returns. Moody ambiance permeates a track or two, and some funky electronic concoction even shows up in one track. My first impression was that this record was so incredibly varied that it could be seen as obtrusive and distracting. I enjoyed everything I heard. Since "Shin-Ken " Persefone have certainly honed their craft and tightened their sound. "Spiritual Migration" is dazzling album. There is something for every fan of metal music here. The band has three main vocal styles, going between loud bellows to blackened shrieks to soulful, clean-sung melodies.